In 2013, the Post-Polio Health International (PHI) organizations estimated that there were six to eight iron lung users in the United States. Now, PHI executive director Brian Tiburzi says he doesn’t know anyone alive still using the negative-pressure ventilators. This fall, I met three polio survivors who depend on iron lungs. They are among the last few, possibly the last three in the US. Their locations form a line that cuts directly through the heart of the country—one in Dallas, one outside Oklahoma City, and one in Kansas City, Missouri—what some call tornado alley. Storms have always been especially difficult for Lillard because if the iron lung loses power, she could die in her sleep. She lives alone, aside from three dogs and 20 geckos that she keeps in plastic terrariums filled with foliage and wool. “They like to sleep in the fleece, wrapped up like a burrito,” she said as she introduced me to a few of her favorites. Lillard sleeps in the iron lung, so it is in her bedroom. Even though the tank is a dull canary yellow it pops in the room, which is painted chartreuse—like the rest of the house, inside and out—and filled with toys and dolls that she has collected throughout her lifetime. On the walls hang a crucifix, a plush Pink Panther, and mirrors strategically placed so she can see around the room and into the hallway. Her iron lung has portholes and windows on the side; a pressure gauge at the top. The machine is actually cobbled together from two iron lungs. One, the March of Dimes gave her when she was a child. The other, she bought from someone in Utah, after she haggled him down from $25,000 to $8,000. The body has also been modified over the years. Her grandfather invented a motorized pulley system that closes the bed tray into the tank after she climbs in. He also replaced the brushed aluminum mirror above the neck slot with a real mirror so that she could have a clear view to the rest of the room when she’s locked in the canister. A local engineer used a motor from an old voter registration device to build a mechanism that tightens the collar around her neck after she slips her head through the portal. The fan belts and half-horsepower motor have been replaced about ten times. When Lillard is outside of the tank, she can breathe using a positive-pressure ventilator, a smaller device that pushes air into her lungs. But that instrument doesn’t provide the same relief as when she puts her entire body into the 640-pound, 7-and-a-half-foot-long apparatus. Plus forcing air into the lungs can cause inflammation or damage the air sacs. When she’s sick, she can only heal if she spends full days in the iron lung. She calls herself “a human battery” because she has to recharge every day. Lillard is 69, 4-foot-9 and weighs 98 pounds. Her back is arched from scoliosis. She didn’t get surgery when she was a child because doctors didn’t expect her to make it to her teenage years and she never had an operation as an adult because polio survivors can stop breathing when they’re on anesthesia. She was infected with polio at her 5th birthday party at the Joyland Amusement Park on June 8th, 1953. Nine days later, her neck ached so bad she couldn’t raise her head off the pillow. Her parents said it was probably just a summer cold, but Lillard could tell they were afraid. They took her in for a spinal tap, which confirmed it was polio. When Lillard was a child, polio was every parent’s worst nightmare. The worst polio outbreak year in US history took place in 1952, a year before Lillard was infected. There were about 58,000 reported cases. Out of all the cases, 21,269 were paralyzed and 3,145 died. “They closed theaters, swimming pools, families would keep their kids away from other kids because of the fear of transmission,” Bruno said. By 1961, there were only 161 reported cases in the US. But in 1988, there were still an estimated 350,000 cases worldwide. That year, the World Health Organization, UNICEF, and Rotary International began an aggressive campaign to end polio everywhere. Last year there were 37 cases reported in Afghanistan, Nigeria, and Pakistan. But even though the last wild case of polio in the US was in 1979, it still haunts this country. “A lot of people think of polio as a disease of the past and don’t realize there are people here today that are still suffering the effects of polio.” said Brian Tiburzi, executive director of Post-Polio Health International (PHI), an advocacy group for the estimated 350,000 to 500,000 polio survivors living in the US. Lillard offered to let me try out her iron lung about an hour after I met her. She showed me how to operate the ad hoc mechanisms that would lock me into the tank and tighten the collar around my neck like a camera shutter—tight enough that no air can escape, but loose enough that I don’t choke myself. I climbed into the bed tray, slipped my head through the hole, tightened the collar, then flipped the switch that controls the pulley that closes the tray into the main canister. As the system locked me in, I had a quick wave of claustrophobic panic and my instinct was to take deep breaths, but a motor was controlling that. I tried to describe the feeling to Lillard, but the machine was inhaling for me, so no sound came out. I had to wait a moment for the release. Being in an iron lung was the most relief and discomfort I have ever felt at the same time. I slowly got used to the mechanical rhythm and began feeling a little relaxed. I tried closing my mouth, and air still rushed in through my lips. I felt like a vacuum cleaner. As I climbed out, Lillard warned me to be careful and not break any of the switches or pulleys. If I damaged anything, and she wasn’t able to get someone to repair it within a few hours, she might not have made it through the night. A few weeks earlier, the collar-opener broke and she was trapped inside. Fortunately, her housekeeper was there to help her force it open, and a friend who does custom metal fabrication for motorcycles, planes, and other machines, Tony Baustert, came a few hours later to repair it. Recently, an ice storm knocked her power out for three days and the generator malfunctioned. The fire department came over but they wouldn’t run a power line from down the street or provide a temporary generator, Lillard said. Fortunately, one of the firefighters came by when he was off-duty and fixed the generator. During the panic, Lillard thought about Dianne Odell, a polio survivor who died in her iron lung in Memphis in 2008, after she lost power during a storm. Her father and brother-in-law took turns pumping the bellows by hand but couldn’t sustain the rhythm long enough to keep her alive. These days her biggest concern is the canvas spiral collar that creates the seal around her neck. She used to have to replace them every few months after they wore out and stopped keeping a seal. Back then she could get them for a few dollars each, but she recently bought two from Respironics for a little more than $200 each. She said the company wouldn’t sell her any more because they only have ten left. For years she’s been trying to find someone to make a new collar. She uses Scotch guard on her current supply and tries not to move her neck around, hoping to make them last as long as possible. I asked her what happens if she runs out. “Well, I die,” she said, in a matter-of-fact tone. Iron lungs became the responsibility of Philips through mergers and acquisitions. The March of Dimes supplied and serviced iron lungs until the end of the ‘60s, around the same time the J.H. Emerson company stopped manufacturing the product. Once Salk’s vaccine diminished the need for polio support and advocacy, March of Dimes handed off iron lung responsibilities to Lifecare Services. Medical supply company Respironics acquired Lifecare in 1996, then merged with Philips in 2007. Philips Respironics denied multiple requests to comment for this story. But polio advocates believe the company can do more to help polio survivors who have struggled with the effects of polio their entire lives. Like Lillard, Paul Alexander, 70, also relies on a mechanic to keep his iron lung running. I met Alexander a few times in his small house in Dallas. 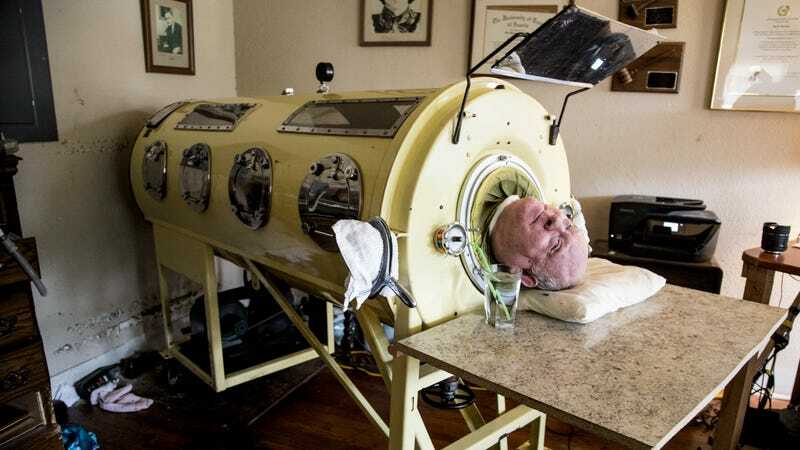 He spends nearly every moment in his iron lung in the center of his living room, which is decorated with degrees, awards, pictures of family, and a drawing of the Scottish folk singer Donovan, who had polio. When people enter the front door a few feet away from him, he usually greets them with a warm upside-down smile, reflected in the mirror above his head. One of the times I visited Alexander, I walked in on him editing a memoir that’s set to be published in a few months. He types and answers the phone with his mouth, using a capped pen attached to a plastic wand he clenches with his teeth. During another visit, his friend and mechanical savior Brady Richards stopped by to check in on Alexander. Alexander hasn’t been to a trial in a few years now as it has become nearly impossible for him to get out of the iron lung for a few hours like he used to do when he went to court and represented clients in a wheel chair. My final visit was Mona Randolph, 81, who lives with her husband Mark, 63, in Kansas City, Missouri. When I first arrived, a helper was tucking Mona into the machine for the night. They lift Mona into the iron lung using a mechanical arm attached to their ceiling since Mark’s back problems prevent him from lifting her into the iron lung, like he used to do when they first met in the ‘80s.